The present feast day is for us the beginning of feast days. Serving as a boundary limit to the law and to foretypes, it at the same time serves as a doorway to grace and truth. "For Christ is the end of the law" (Rom 10:4), Who, having freed us from the writing, doth raise us to spirit. Here is the end (to the law): in that the Lawgiver, having made everything, hath changed the writing in spirit and doth head everything within Himself (Eph 1:10), hath taken the law under its dominion, and the law is become subjected to grace, such that the properties of the law not suffer reciprocal commingling, but only suchlike, that the servile and subservient (in the law) by Divine power be transmuted into the light and free (in grace), "so that we," sayeth the Apostle, "be not enslaved to the elements of the world" (Gal 4:3) and be not in a condition under the slaveish yoke of the writing of the law. Here is the summit of Christ's beneficence towards us! Here are the mysteries of revelation! Here is the theosis [divinisation] assumed upon humankind -- the fruition worked out by the God-man. The radiant and bright coming-down of God for people ought to possess a joyous basis, opening to us the great gift of salvation. Such like also is the present feastday, having as its basis the Nativity of the Mother of God, and as its purposful end -- the uniting of the Word with flesh, this most glorious of all miracles, unceasingly proclaimed, immeasurable and incomprehensible. The less comprehensible it is, the more it is revealed; and the more it is revealed, the less comprehensible it is. Wherefore the present God-graced day, the first of our feastdays, showing forth the light of virginity and as it were the crown woven from the unfading blossoms of the spiritual garden of Scripture, doth proffer creatures a common joy. 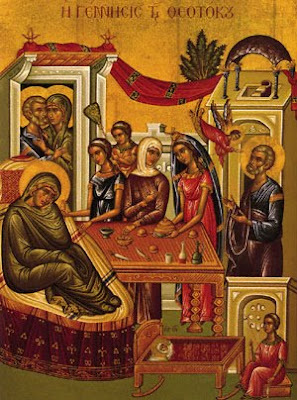 Be of good cheer -- sayeth it -- behold, this is the feast of the Nativity of the Virgin and of the renewal of the human race! The Virgin is born, She groweth and is raised up and prepareth Herself to be the Mother of God All-Sovereign of the ages. All this, with the assist of David, makes it for us an object of spiritual contemplation. The Mother of God manifests to us Her God-bestown Birth, and David points to the blessedness of the human race and wondrous co-kinship of God with mankind. And thus, truly one ought to celebrate the mystery today and to offer to the Mother of God a word by way of gift: since nothing is so pleasing to Her, as a word and praise by word. It is from here also that we receive a twofold benefit: first, we enter into the region of truth, and second, we emerge from the captivity and slavery of the written law. How? Obviously, when darkness vanishes, then light appears; so also here: after the law there follows the freedom of grace. The present day solemnity is a line of demarcation, separating the truth from its prefigurative symbol, and ushering in the new in place of the old. Paul -- that Divine Trumpeter of the Spirit -- exclaims thus about this: "For anyone that be in Christ, ye are remade a new creature; the old passeth away and behold all is become new" (2 Cor 5:17); "for the law hath perfected nothing adducing for a better hope, whereby we draw nigh to God" (Heb 7:19). The truth of grace hath shown forth brightly. Let there now be one common festal celebration in both heaven and on earth. Let everything now celebrate, that which is in the world and that beyond the world. Now is made the created temple for the Creator of all; and creation is readied into a new Divine habitation for the Creator. Now our nature having been banished from the land of blessedness doth receive the principle of theosis and doth strive to rise up to the highest glory. Now Adam doth offer from us and for us elements unto God, the most worthy fruit of mankind -- Mary, in Whom the new Adam is rendered Bread for the restoration of the human race. Now is opened the great bosom of virginity, and the Church, in the matrimonial manner, doth place upon it a pure pearl truly immaculate. Now human worthiness doth accept the gift of the first creation and returns to its former condition; the majesty darkened by formless sin -- through the conjoining by His Mother by birth "of Him made beautiful by Goodness," man receives beauty in a most excellent and God-seemly visage. And this creating is done truly by the creation, and recreation by theosis, and theosis by a return to the original perfection! Now a barren one is become beyond expectation a mother, and the Birth-giver hath given birth without knowing man, and she doth sanctify natural birth. Now is readied the majestied color of the Divine scarlet-purple and the impoverished human nature is clothed in royal worthiness. Now -- according to prophecy -- there sprouts forth the Offshoot of David, Who, having eternally become the green-sprouting Staff of Aaron, hath blossomed forth for us with the Staff of Power -- Christ. Now of Judah and David is descended a Virgin Maiden, rendering of herself the royal and priestly worthiness of Him that hath taken on the priesthood of Aaron in the order of Melchisedek (Heb 7:15). Now is begun the renewal of our nature, and the world responding, assuming a God-seemly form, doth receive the principle of a second Divine creation. The first creation of mankind occurred from the pure and unsullied earth; but their nature darkened the worthiness innate to it, they were deprived of grace through the sin of disobedience; for this we were cast out of the land of life and, in place of the delights of paradise, we received temporal life as our inheritance by birth, and with it the death and corruption of our race. All started to prefer earth to heaven, such that there remained no hope for salvation, beyond the utmost help. Neither the natural nor the written law, nor the fiery reconciliative sayings of the prophets had power to heal the sickness. No one knew how to rectify human nature and by what means it would be most suitable to raise it up to its former worthiness, so long as God the Author of all did not deign to reveal to us another arranged and newly-constituted world, wherein is annihilated the pervasive form of the old poison of sin, and granting us a wondrous, free and perfectly dispassionate life, through our re-creation in the baptism of Divine birth. But how would this great and most glorious blessing be imparted to us, so very in accord with the Divine commands, if God were not to be manifest to us in the flesh, not subject to the laws of nature -- nor deign to dwell with us in a manner, known to Him? And how could all this be accomplished, if first there did not serve the mystery a Pure and Inviolate Virgin, Who contained the Uncontainable, in accord with the law, yet beyond the laws of nature? And could some other virgin have done this, besides she alone, who was chosen before all others by the Creator of nature? This Virgin is the Mother of God -- Mary, the Most Glorious of God, from the womb of Whom the Most Divine issued forth in the flesh and by whom He Himself did arrange a wondrous temple for Himself. She conceived without seed and gave birth without corruption, since that Her Son was God, though also He was born in the flesh, without mingling and without travail. This Mother, truly, avoided that which is innate to mothers but miraculously fed with milk Her Son, begotten without a man. The Virgin, having given birth to the Seedlessly Conceived-One, remained a Pure Virgin, having preserved incorrupt the marks of virginity. And so in truth She is named the Mother of God; her virginity is esteemed and her birth-giving is glorified. God, having conjoined with mankind and become manifest in the flesh, hath granted Her a unique glory. Woman's nature suddenly is freed from the first curse, and just as the first did bring in sin, so also doth the first initiate salvation also. But our discourse has attained its chief end, and I, celebrating now and with rejoicing sharing in this sacred feast, I greet you in the common joy. The Redeemer of the human race -- as I said -- willed to arrange a new birth and re-creation of mankind: like as under the first creation, taking dust from the virginal and pure earth, wherein He formed the first Adam, so also now, having arranged His Incarnation upon the earth, -- and so to speak, in place of dust -- He chooses from out of all the creation this Pure and Immaculate Virgin and, having re-created mankind within His chosen-one from amidst mankind, the Creator of Adam is made the New Adam, in order to save the old. Who indeed was this Virgin and from what sort of parents did she come? Mary, the glory of all, was born of the tribe of David, and from the seed of Joachim. She was descended from Eve, and was the child of Anna. Joachim was a gentle man, pious, raised in God's law. Living prudently and walking before God he grew old without child: the years of his prime provided no continuation of his lineage. Anna was likewise God-loving, prudent, but barren; she lived in harmony with her husband, but was childless. As much concerned about this, as about the observance of the law of the Lord, she indeed was daily stung by the grief of childlessness and suffered that which is the usual lot of the childless -- she grieved, she sorrowed, she was distressed, and impatient at being childless. Thus, Joachim and his spouse lamented that they had no successor to continue their line; yet the spark of hope was not extinguished in them completely: both intensified their prayer about the granting to them of a child to continue their line. In imitation of the prayer heard of Hannah (1 Kings 1: 10), both without leaving the temple fervently beseeched God that He would undo her sterility and make fruitful her childlessness. And they did not give up on their efforts, until their wish be fulfilled. The Bestower of Gifts did not condemn the gift of their hope. The unceasing power came quickly in help to those praying and beseeching God, and it made capable both the one and the other to produce and bear a child. In such manner, from sterile and barren parents, as it were from irrigated trees, was borne for us a most glorious fruition -- the Immaculate Virgin. The constraints of infertility were destroyed -- prayer, upright manner of life -- these rendered them fruitful; the childless begat a Child, and the childless woman was made a happy mother. Thus the immaculate fruition issuing forth from the womb occurred from an infertile mother, and then the parents, in the first blossoming of her growth brought her to the temple and dedicated her to God. The priest, then making the order of services, beheld the face of the girl and of those in front of and behind, and he became gladdened and joyful, seeing as it were the actual fulfillment of the Divine promise. He consecrated her to God, as a reverential gift and propitious sacrifice and, as a great treasury unto salvation, he led her within the very innermost parts of the temple. Here the Maiden walked in the upright ways of the Lord, as in bridal chambers, partaking of heavenly food until the time of betrothal, which was preordained before all the ages by Him Who, by His inscrutable mercy, was born from her, and by Him Who before all creation and time and expanse Divinely begat Him, and together with His consubstantial and co-reigning and co-worshipped Spirit -- this being One Godhead, having One Essence and Kingdom, inseparable and immutable and in which is nothing diverse, except the personal qualities. Wherefore, in solemnity and in song I do offer the Mother of the Word the festal gift; since that He born of her hath taught me to believe in the Trinity: the Son and Word without beginning hath made in her His Incarnation; the Father begetting Him hath blessed this; the Holy Spirit hath signed and sanctified the womb which incomprehensibly hath conceived. Now is the time to question David: in what did the God of all forswear him? Speak, O Psalmist and Prophet! He hath sworn from the fruit of my loin to sit upon my throne (Ps 131:11). Here in this He is forsworn and wilt not break His oath, He hath forsworn and His Word is sealed with a deed! "Once," said he, "I forswear by My Holiness, that I lie not to David; his seed wilt prevail forever, and his throne, like the sun before Me and like the moon coursing the ages: a faithful witness also in heaven" (Ps 88:35-38). God hath fulfilled this oath, since it is not possible for God to lie (Heb 6:18). Consider this: Christ in the flesh is named my Son (Mt. 22: 42), and all nations will worship my Lord and Son (Ps 71:11), seeing him sit upon a virginal throne! Here also is the Virgin, from whose womb the Pre-eternal One issued forth, incarnated at the end of the ages and renewing the ages, likewise sprung forth from my loins! All this is so! People of God, holy nation, sacred gathering! Let us revere our paternal memory; let us extol the power of the mystery! Each of us, in the measure given by grace, let us offer a worthy gift for the present feast. Fathers, a prosperous lineage; mothers, fine children; the unbearing, the not-bearing of sin; virgins, a twofold prudence of soul and of body; betrothed, praiseworthy abstinence. If anyone of you be a father, let him imitate the father of the Virgin; and if anyone be without child, let them make harvest of fruitful prayer cultivating a life pleasing to God. The mother, feeding her children, let her rejoice together with Anna, raising her Child, given to her in infertility through prayer. She that is barren, not having given birth, lacking the blessing of a child, let her come with faith to the God-given offshoot of Anna and offer there her barrenness. The virgin, living blamelessly, let her be a mother by discourse, adorning by word the elegance of soul. For a betrothed, let her offer mental sacrifice from the fruits of prayer. All together rich and poor, lads and maidens, old and young (Ps 48:2, 148:12), priests and levites -- let all together keep the feast in honor of the Maiden, the Mother of God and the Prophetess: from Her hath issued forth the Prophet, foretold of by Moses, Christ God the Truth (Dt 18:15). Amen.